CaptainKudzu: Is the Egyptian revolution good or bad? As the people of Georgia watched the Egyptian crowds rallying in opposition to Hosni Mubarak, many probably wondered what will come next and what it means for the rest of the world. While Georgians from Egypt Community in Effingham County to Cairo in Grady County likely are happy for the newfound freedom of the Egyptians, it is equally likely that they profoundly hope that it does not lead to further violence that will require American involvement. As the protests in Egypt turned increasingly violent today, many in this country and around the world are asking what comes next. The answer to that question largely depends on who comes next. 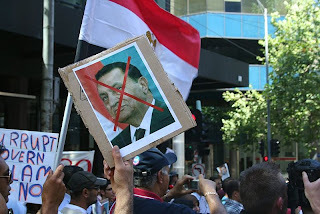 At this point there is no credible leader to replace current Egyptian President Hosni Mubarak. Mubarak recently bowed to public pressure and announced that he will not seek re-election in national elections this September. The most visible candidate for the job is Mohamed Elbaradei. Elbaradei, who recently announced his openness to running, is the most visible opposition leader. 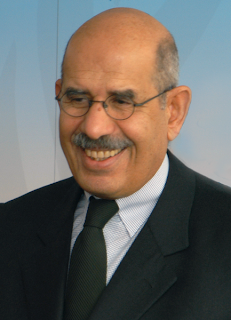 Elbaradei served three terms as Director General of the International Atomic Energy Agency (IAEA). During his tenure at the UN, Elbaradei faced US opposition because of his belief that Iran was not working to build a nuclear weapon. The big question today is whether Elbaradei backs the democracy movement or the Muslim Brotherhood. Many observers, including Middle East expert Joel Rosenberg, believe that Elbaradei is sympathetic to the Muslim Brotherhood and Iran. 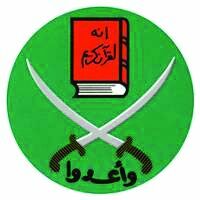 The Muslim Brotherhood is a radical Islamic organization founded in 1928. The group was founded by Hassan al-Banna, an admirer of Adolf Hitler. The Brotherhood espoused Wahabism, the same form of Islam touted by Saudi financier and terrorist Osama bin Laden. Wahabbi Muslims believe that jihad should be used to spread Islam throughout the world. The Muslim Brotherhood has long been banned in Egypt because of its insistence on enacting sharia law (although some Brotherhood members were elected to Egypt’s parliament as independents). Members of the Brotherhood assassinated Hosni Mubarak’s predecessor, Anwar Sadat, in 1981 in retaliation for Sadat’s decision to sign a peace treaty with Israel. It was also a member of the Muslim Brotherhood, Ayman al-Zawahiri, who helped form Egyptian Islamic Jihad and became a leading al-Qaeda cleric. If the Muslim Brotherhood were to take over Egypt, the country might well become another Islamic theocracy like Iran or a terrorist state like Gaza, where terrorist group Hamas won democratic elections. On the other hand, some in the West believe that the Muslim Brotherhood is capable of becoming a peaceful political organization. Disturbingly, the Obama Administration has hinted that there might be a place for groups like the Muslim Brotherhood in the new Egyptian government. Today there is no charismatic leader of the Brotherhood akin to Iran’s Ayatollah Khomeini which might help to prevent the group from seizing control of the country. Likewise, the Egyptian uprisings seem to be spontaneous, secular, and democratic rather than inspired by religious fundamentalism. The Brotherhood has admitted that they are not responsible for the uprising, although they are a dominant part of the opposition to Mubarak’s regime. But if the Muslim Brotherhood lacks a national leader, so does the democracy movement. Like the American Tea Party, the Egyptian protests seem to be a grass roots movement made possible by the internet and modern telecommunications. It can be a drawback, as well as a strength, of such movements that they have no national leader. The Tea Party had an established national opposition party to work with, but Egypt’s democracy movement will be starting from scratch. A popular uprising can throw a dictator from power, but a country cannot be run by a mob. The final major player in the coming Egyptian history is the army. The army could have cracked down on protesters as the Chinese did at Tiananmen Square in 1989 when the People’s Liberation Army killed thousands of protesters. The Egyptian army has been involved in politics for decades since overthrowing the monarchy in 1952. After being involved in several disastrous wars against Israel, it is likely that the army would want to preserve Egypt’s secular government and act to prevent the country from becoming a radical Islamist state. The army might also eventually move to restore order if the violence between opposition and pro-Mubarak protesters becomes too prevalent.